What’s your favourite thing about Christmas? The food? The time spent with family? The true meaning behind it all? My favourite thing, hands down, is wrapping presents. In fact, it’s possible I almost spend more time choosing the wrapping paper and ribbons than the gift inside. Almost. When I was younger, I loved to choose just the right paper and pair it up with my favourite thing in the world: printed Christmas tape. For me, it wasn’t a proper Christmas present if it wasn’t sealed up with decorated tape. This year, I took a slightly different approach. I’ve been trying to cut down on unnecessary spending, so instead of buying some classy wrapping paper and ribbons, I looked around and asked, What do I already have that I can use for Christmas wrapping? And in a completely coincidental stroke of luck not long afterwards, I happened to be putting away the sandwich press when I knocked a packet of fancy-pants printed napkins out of the cupboard. I’ve never had inanimate objects answer direct questions before and I’m not sure if I’d like it to happen again, ’cause it borders on creepy. However, they were exactly what I was looking for and when combined with the one other commodity found in vast amounts in this house, ie. 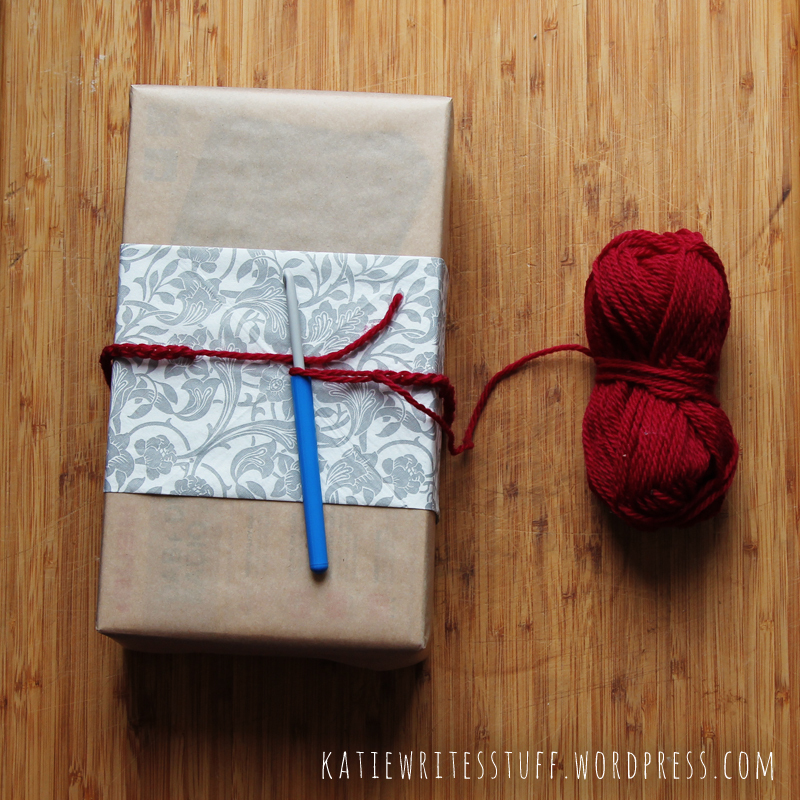 wool, they turned my presents into this: Want to know how I did it? You’re in luck: there’s a tutorial for you! 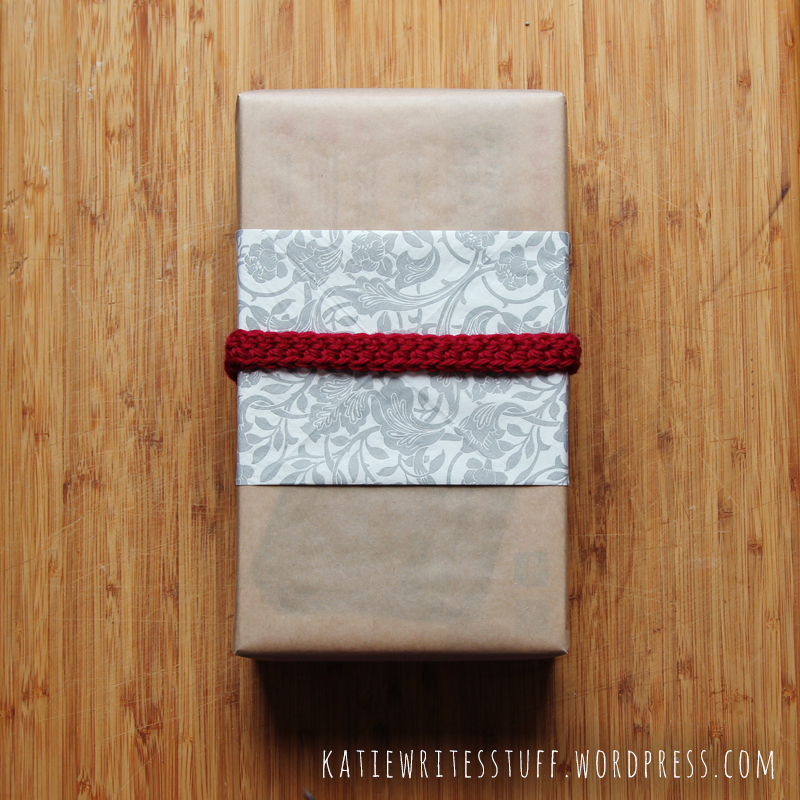 A present, already wrapped. I love using plain brown paper for this, which is probably something to do with my inner hipster. Fancy-pants napkins, preferably large. 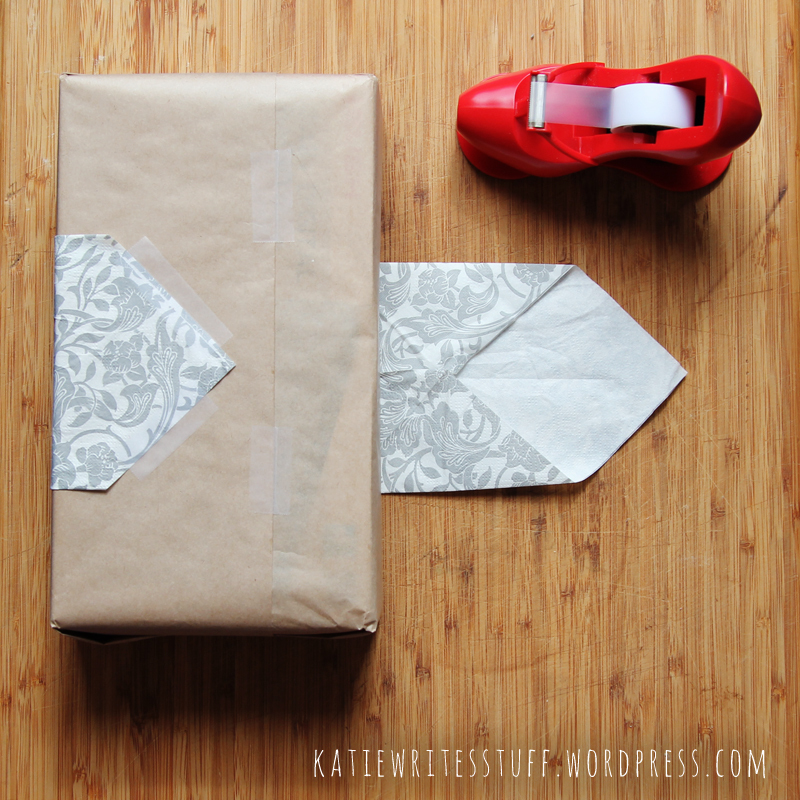 Alternatively, you could also use scraps of a different type of wrapping paper or even scraps of fabric. Anything you have lying about the house is fair game. Sticky tape. Don’t worry if your dispenser isn’t in the shape of a shoe – it will still work fine. Wool. Any size, any type, any colour. Use whatever you have to hand. 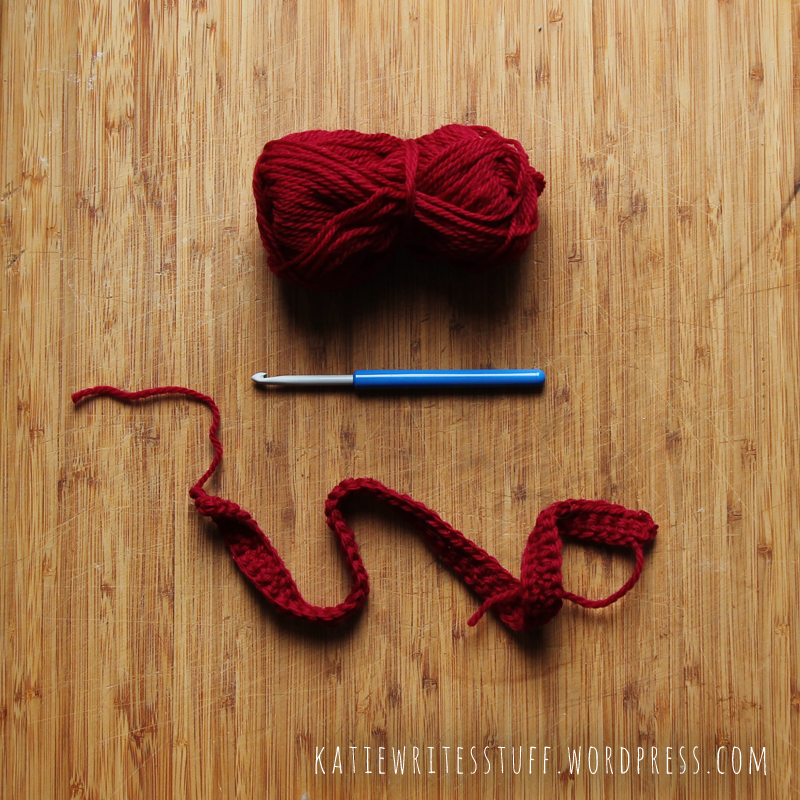 Crochet hook. Use whichever size suits your wool. 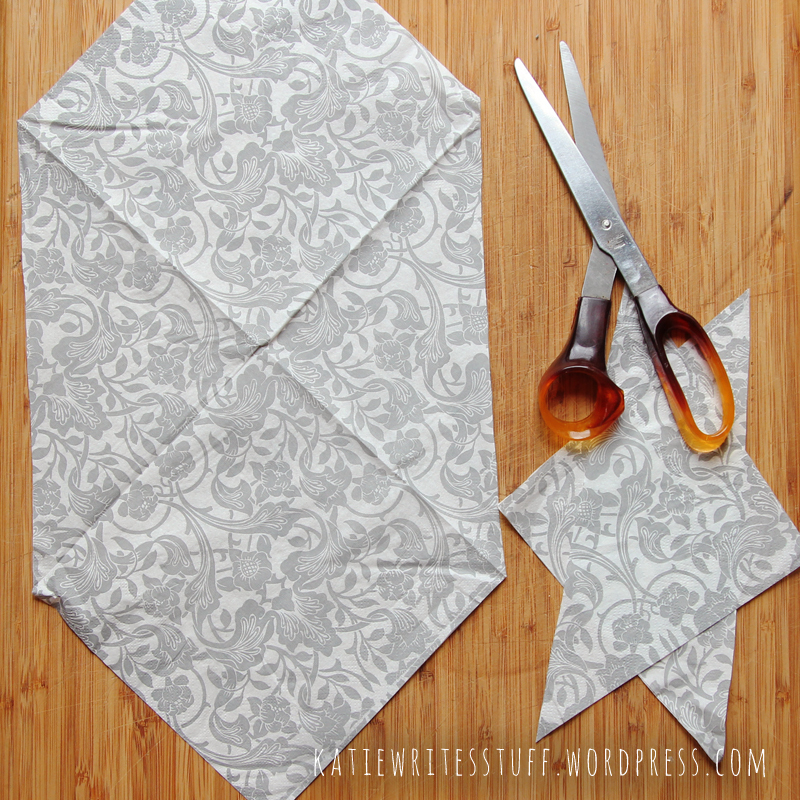 Work out how your napkin will best fit your present. It doesn’t need to go all the way around, but it will need to at least reach the bottom of the present. In this case, I cut my napkin diagonally. 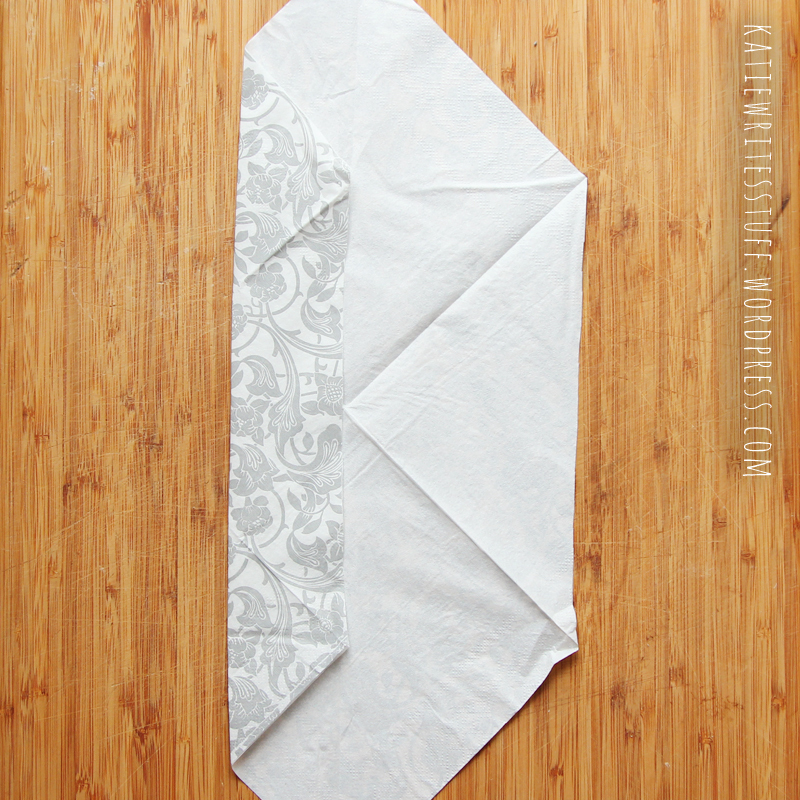 Mark the centre of your napkin (folding it briefly in half is the best way), then fold the outside edges to the centre so there are no rough edges showing. 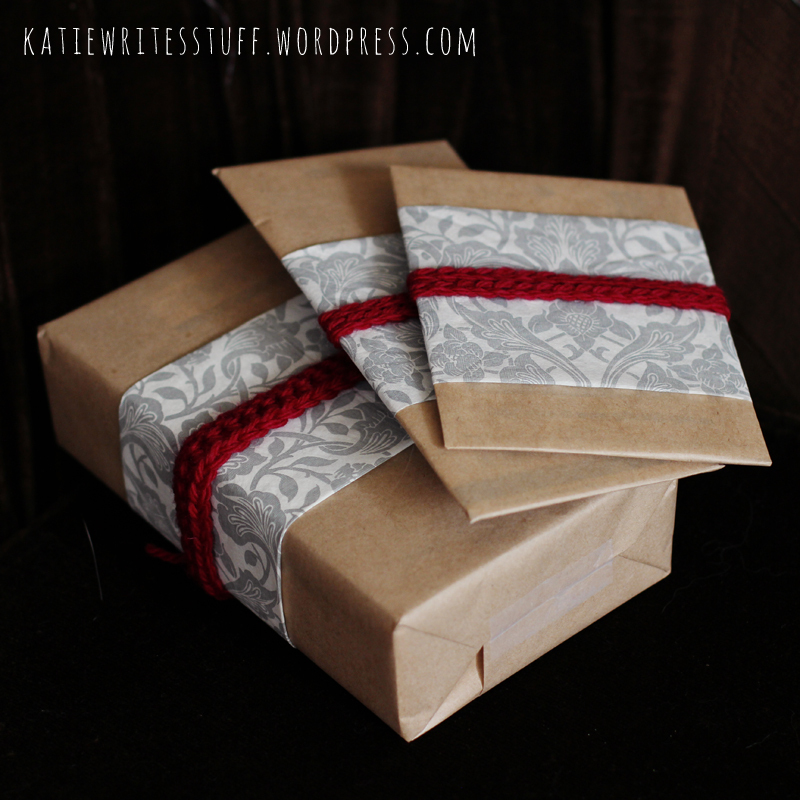 Wrap the napkin around your present and secure it to the bottom with sticky tape. It’s time to break out the wool and crochet hook. Make a chain using loose tension and measure it against your present until it meets at the back. When measuring, stretch the chain as tightly as you can and make sure the ends are just touching. If it overlaps at this point, you won’t be able to tie it properly when you’re done, so even if it’s slightly overlapping, just un-do a couple of stitches. The cat is again optional at this point. Skip 2 stitches and double crochet (US single crochet) into the third stitch on the chain. Double crochet for the remaining length of the chain. Turn. Make 2 chain, then double crochet all the way to the other end and tie off. Looking good! Feel free to make yourself a cuppa at this point. Instagramming your progress is also an option. 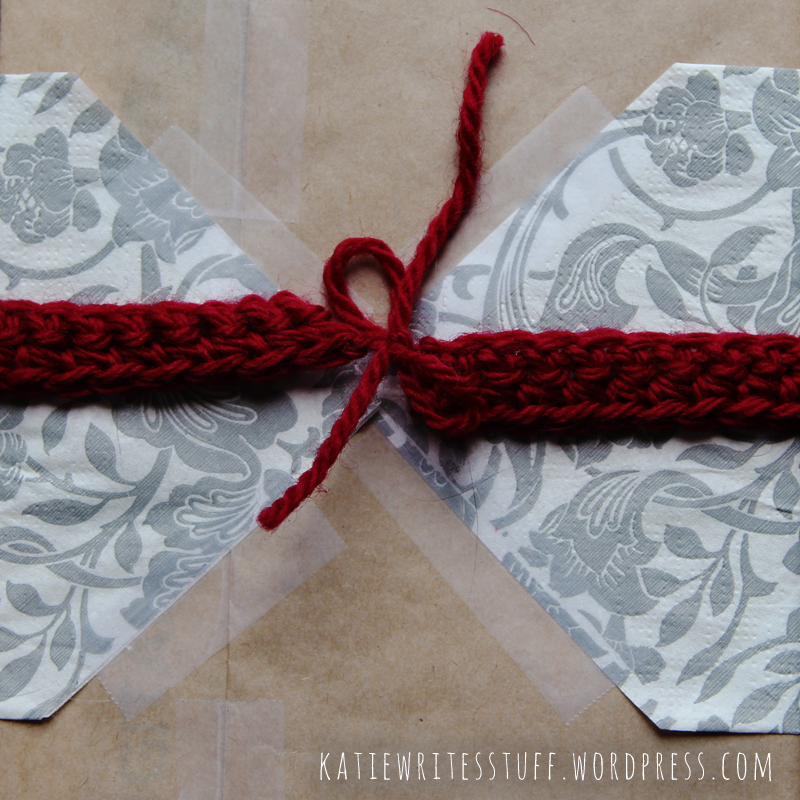 Wrap your crochet band around your present and tie it in a bow at the bottom. You’re done! 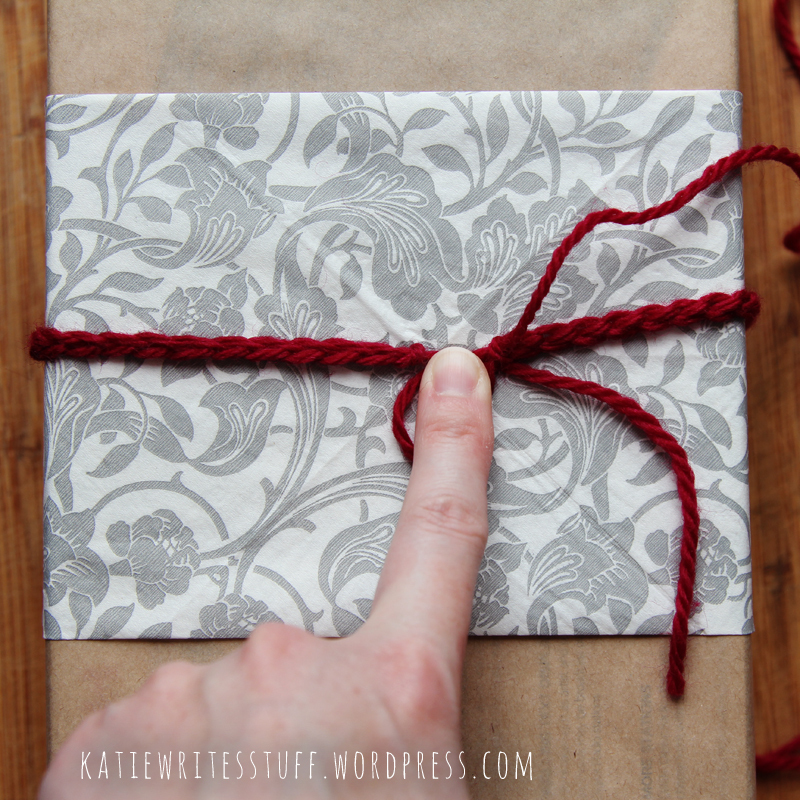 For smaller presents, you could simply create a longer chain and wrap it a couple of times around the gift. For larger presents, you could use two rows of treble crochet (US double crochet) or more rows of double. Remember: always complete even rows of whichever stitch you choose. This ensures that you have wool at either end of the band in either to tie it to the bottom of the present. How easy is that? Now all you need to do is remember to buy some new napkins before you have guests. Or they could just use tissues; they’ll be fine. If you do end up using this tutorial, please share some pics of your finished product. I’d love to see the individual spin everyone else puts on it. 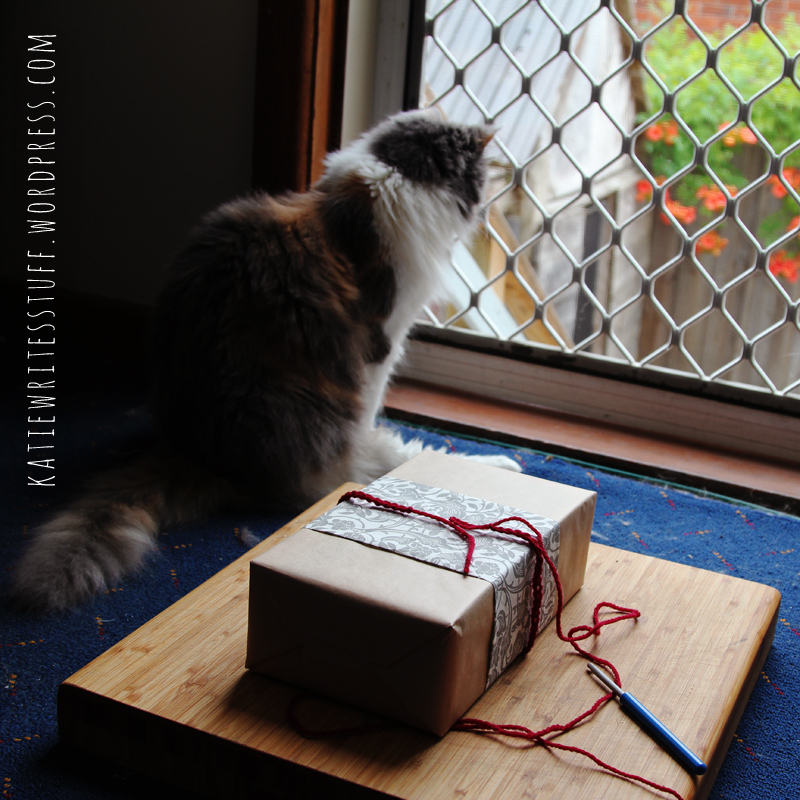 Most importantly: have fun with your gift wrapping and a have a wonderful festive season! 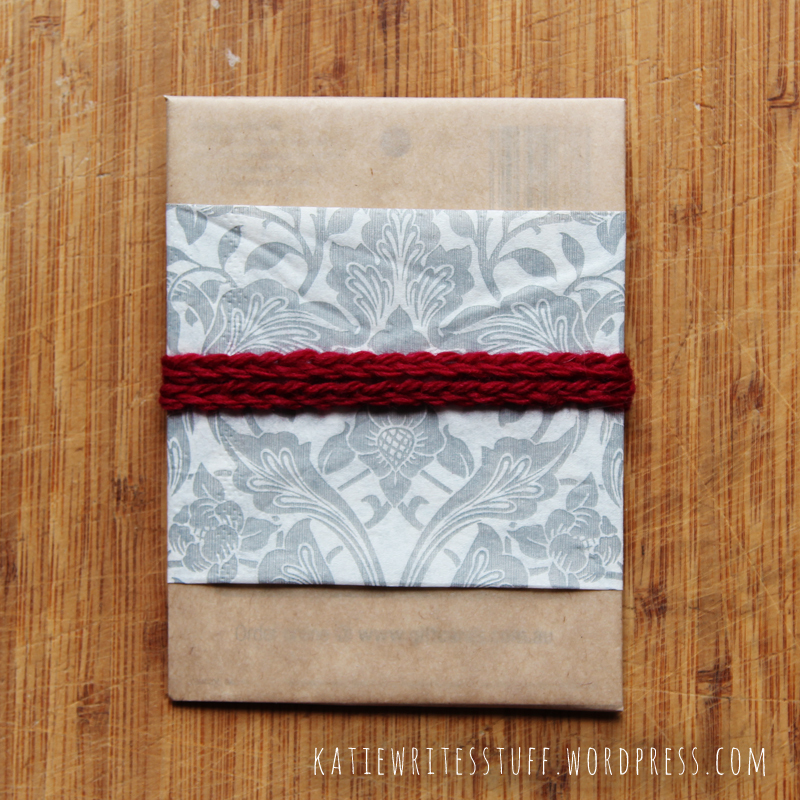 The grey & red colour combo with the brown paper works so well! 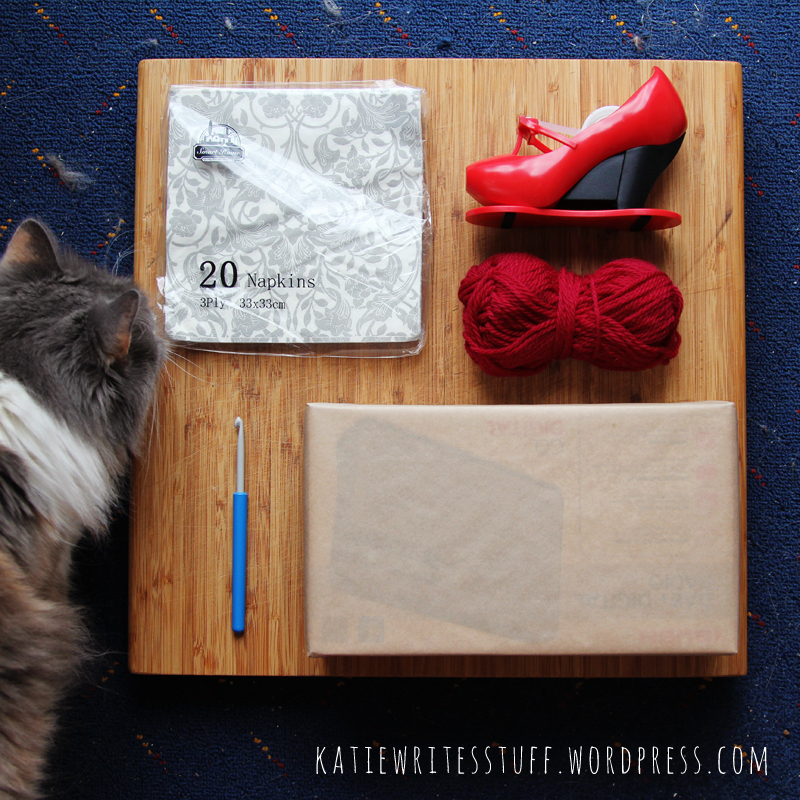 I would try it out except I can’t crochet ( but it is on my ” learn to do” list); nor do I have a cat ( optional). Maybe I could substitute with knitting, and an optional rabbit instead? Thanks! It all came together so perfectly, thanks to that random packet of napkins falling out of the cupboard. Knitting would definitely work a treat and I think an optional rabbit would be a perfect complement to the whole process.